Booking forms are what patrons submit in order to place a booking. When a user submits a booking, they're required to enter their name and email address by default. However, if you'd like to gather more information from users, you can create customized booking forms with additional questions. For example, you could add fields for gathering a patron's phone number or ID number, or you could ask patrons if they need any amenities for spaces, help with equipment, or just general feedback. You can apply booking forms to entire locations, and/or individual categories, spaces, & items. When a location, category, and/or item/space have a booking form assigned to it, the questions in each will combined into a single form for the patron to fill out. Although there's no limit to the number of questions you can add to a form, try to limit the number of required fields -- too many fields can turn away some users. Data from your booking forms will be displayed in the booking's details throughout the Equipment and Spaces module. This includes the Booking Explorer, where you can also filter bookings by form responses. They're even included in your Booking Explorer exports, as well. 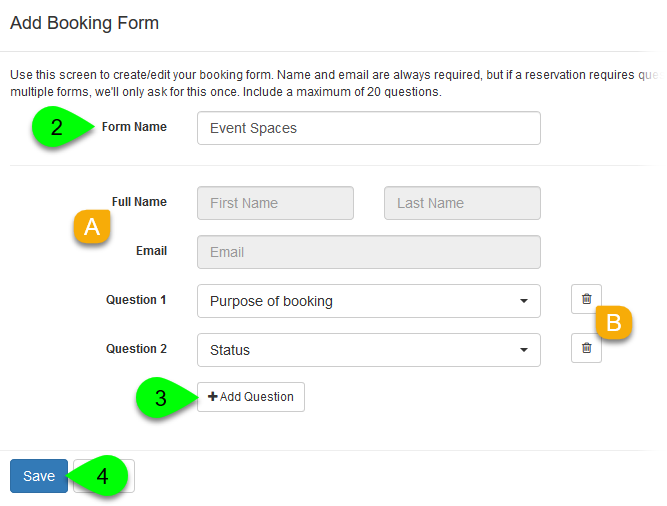 Booking forms for different locations: if some locations have unique questions, it can be helpful to give them their own booking form. Booking forms for different categories: if certain groups of spaces or equipment require additional information, you could give them their own booking form. Questions from that form would then be combined with the questions from that location's booking form. Booking forms for different spaces or items: if individual spaces or items require more info from patrons, you can assign them their own booking form. Questions from that form would be combined with the questions from that location's and/or category's booking form. In the Booking Forms panel, click on the Add New Form button. 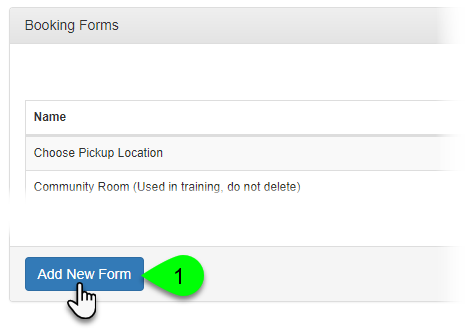 In the Add Booking Form window, label your form using the Form Name field. Click on the Add Question button and select a question from your Question Bank using the dropdown menu. Repeat to add more questions to the form. The Full Name and Email fields are required and will always appear at the top of the form. All other questions will appear below them in the order you've assigned. Click on the Delete () button next to a question to remove it. Once you've added all of your questions, click the Save button. To edit a form, click on its Edit () icon in the Actions column. To delete a form, click on its Delete () icon in the Actions column. You can only delete forms not currently in use.